Marie-Louis-Adolphe Thiers (1797-1877) was a prominent figure in a turbulent period in French history. Described by Karl Marx as a 'monstrous gnome' and condemned by the left for suppressing the Paris Commune of 1871, he enjoyed a controversial political career, but it is for his epic Histoire de la Revolution Francaise that he is chiefly remembered today. It was first published in French in ten volumes between 1823 and 1827, and in 1838 Frederic Shoberl's English translation made it a staple of British bookshelves. 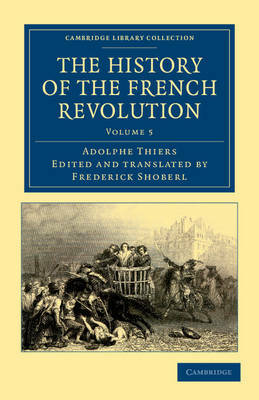 Consolidated into five volumes and illustrated with an array of engravings, this edition presents readers with a history of events spanning more than a decade of revolution and war, and remains one of the most comprehensive accounts of the French Revolution. Volume 5 concludes the narrative with accounts of military campaigns abroad, political in-fighting at home, and Napoleon's coup d'etat of November 1799.